Chicken Breast Fillet (70%), WHEAT Flour, Vegetable Oil (Cottonseed and Sunflower), Water, Breadcrumb (WHEAT Flour, Salt and Yeast), Maize Starch, Salt, Spices (CELERY, MUSTARD, Pepper, Garlic, Onion), Stabilisers (E451i, E331iii, E450i), Dextrose, Rice Flour, Raising Agents (E450i, E500ii), Modified Starch, WHEAT Gluten, Rusk Flour (contains WHEAT GLUTEN), Maize Flour, EGG Albumin, EGG Powder, Flavouring, Yeast Extract and Colouring (E160c). For the best results cook from frozen. Cook Product to a core temperature of 75°C. OVEN: Pre-heat oven to 200°C/390°F/Gas mark 6. 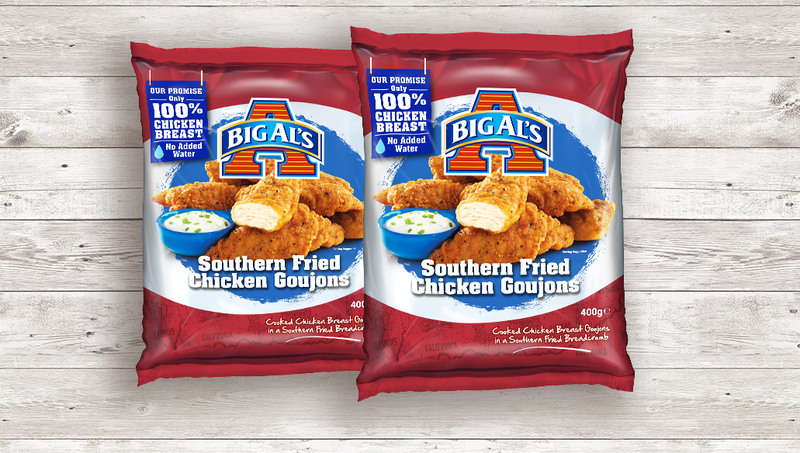 Place the Big Al’s chicken fillets onto a flat baking tray and cook for 15 to 20 minutes, turning occasionally during cooking.